128 GB SAMSUNG SSD. BACK LIT KEYBOARD. 8GB DDR3 1600 MHz. 65W LENOVO POWER ADAPTER. USED NOTEBOOK, GOOD CONDITION, FEW SCRATCHES ON THE COVER AND SCUFFS AROUND THE EDGES. REFER TO PHOTOS FOR MORE DETAILS. 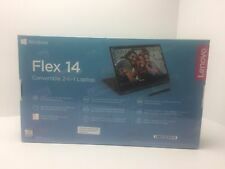 Lenovo ThinkPad X1 Carbon 1St Gen.14" (Non Touch) Laptop PC i7-3667U 128GB SSD 8GB (NON TOUCH). Series Lenovo ThinkPad X1 Carbon (TP00040A). Hardware Platform PC. Hard Drive Interface Serial ATA. Trending at $325.00eBay determines this price through a machine learned model of the product's sale prices within the last 90 days. 128GB SOLID STATE Hard Drive. Unit for sale is a Lenovo X1 Carbon 2nd Gen Laptop. This machine has been fully tested, and is ready to use. Has a fresh version of Windows 10 Proffesional. Features a high-speed i5 4th Gen processor It will be ready to go out of the box! Genuine Windows 10 Pro + SSD + 8GB RAM !! This makes these computers great for digital art. upgraded with 250gb msata ssd and 500gb hdd. Great option for digital artists wanting to start drawing. This Thinkpad is the most expensive tablet model you could buy from Lenovo when it was new. IBM ThinkPad T450 Laptop Computer. Backlit Keyboard. The laptop shown is similar in appearance to the laptop you will receive. AC Adapter. Firefox Browser. 3 x USB 3.0. 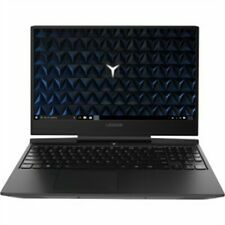 Lenovo ideapad 330S-15ARR Laptop Win.10/8GB RAM/1TB/AMD Ryzen 5/Radeon Vega Gfx - Tested and working. Laptop is in great condition, reset to factory settings and ready to use. There might be a few scuffs/scratches on the exterior from handling. Lenovo Thinkpad T440 20B7-003VUS. 128GB SSD Hard Drive. i5 4300U 1.9GHz. AC Adapter and Battery Included. Tested Laptop with Win 7 Pro loaded and ready to use. We make every effort to respond as quickly as we can during normal office hours 9AM - 5PM. We are located in Austin, Texas. View their web site regarding this policy. Trending at $205.00eBay determines this price through a machine learned model of the product's sale prices within the last 90 days. SATA 128GB solid state drive for an amazingly smooth and fast computing experience. Also, we do not have a price matching policy. We will not price match to a lower price. Windows 10 is so familiar and easy to use, you'll feel like an expert. LENOVO T440s LAPTOP. This laptop has been tested and if fully functional. HARD DRIVE: 128GB SSD Solid State Drive SATA 6.0Gb/s. WINDOWS 10 PROFESSIONAL. Windows 10 Professional 64-bit Installed. One Always-on USB 3.0 connector. Lenovo Thinkpad X220 Laptop. 128 GB SSD Solid S tate. It is loaded with Windows 10 Professional and is fully functional. Docking Station with (((optical drive))) Included, (((Key is not Included))). Batteries are excluded from our warranty. 128GB Solid State Drive! 8GB DDR3 RAM! 4x USB 2.0, Headphone/microphone combo jack port, LAN port, VGA port, Dock port. More than enough room for all of your important data. Hard Drive. 14" HD Panel. IBM ThinkPad T440 Laptop Computer. The laptop shown is similar in appearance to the laptop you will receive. AC Adapter. 14" 1600 x 900 LCD. Open Office. Lenovo X1 Carbon i7 Gen2 4600U 2.1 GHz 8GB RAM 128GB SSD 14" Win 10. This is not a touch screen. 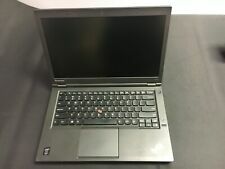 Lenovo ThinkPad L460 14in. (i5 6th Gen. 2.4GHz, SSD 128GB RAM 8GB)..
FUNCTIONALITY: Tested, fully functional. Non-touchscreen model. Charcoal palmrest with black back cover in matte finish. HEAVY WEAR Excessive use: large cracks, broken and/or missing pieces. 4GB RAM( expandable to 8GB), 120GB solid state drive, DVD-RW. 15.6" display LED Backlight, HD Anti-Glare Display, 10/100Base-T Fast Ethernet, 802.11ac Wireless LAN, Bluetooth 4.1 1 x DC-in port, 1 x Ethernet port, 1 x HDMI port, 1 x headphone/microphone jack, 1 x USB 2.0 port, 1 x USB 3.0 port. NOTE: KEYBOARD IS NOT WORKING. Sold As-IS. - Microsoft Security Essentials - FULL PROTECTION FOR ALL INTERNET ACTIVITY RIGHT OUT OF THE BOX! CONNECT TO THE INTERNET WITH WIFI OUT OF THE BOX! CONNECT TO THE INTERNET WITH LAN OUT OF THE BOX! 128GB SSD (Solid State Drive). Item works perfectly fine. 1920 x 1080 ( Full HD ). Bluetooth Module Built-in. (Love to binge watch your favorite shows?. Need a laptop for school or work?. FreshTechDirect has you covered. LENOVO 14" THINKPAD T440P. 5) 100% Authentic and genuine products. We will be happy to help you with anything about our products. Top Rated PlusType: Notebook/LaptopBrand: LenovoProcessor: Intel Core i5 4th Gen.
Lenovo X301, SU9600(1.6GHz), 4GB RAM, 128GB SSD, 13.3in 1440x900, 3 BATTERIES!!! X301 TYPE2776-3CU. It has 2x2GB RAM and a Samsung 128GB mSATA drive on a 1.8" adapter, similar to the one shown above. (Note: the SSD shown above is of a different 80GB mSATA SSD, just shown for info!). 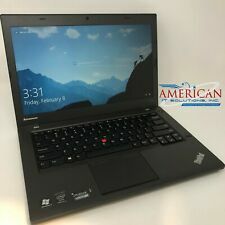 Great condition Lenovo x1 carbon 4th generation, i5 6200, 8gb ram, 128gb SSD. you will need to install Windows and Lenovo drivers for full functionality of laptop. These drivers are free and can be downloaded from “software update” and from Lenovo. With a best-in-class keyboard, solid performance, plenty of ports. 128GB Solid State Drive. Pre-enjoyed Thinkpad Helix. GREAT CONDITION! Ready to go! - Win10 Pro 64. - 3c Li-Ion. - Secure chip. Up for sale is a Lenovo T460s Ultrabook. Model 20FA-S0HR00. It pre-owned. It is in excellent condition. It may have a few scratches or rub marks as with normal use. 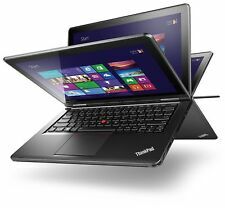 LENOVO THINKPAD T460S ULTRABOOK. 128GB TOSHIBA SSD. FINGERPRINT READER. 1.9 GHz BOOST @2.49GHz. 45W LENOVO POWER ADAPTER. OPTICAL DRIVE. HARD DRIVE. PRODUCT LINE. USED NOTEBOOK, GOOD CONDITION, FEW SCRATCHES ON THE COVER AND SCUFFS AROUND THE EDGES. Lenovo ThinkPad X240. SSD (Solid State Drive). Solid State Drive (SSD). INCLUDES: Laptop with Battery and AC Adapter. It's made to last and it's truly the largest difference between the stuff you "can get" and the stuff you must have to change the way you compute. Lenovo ThinkPad X220 Tablet. 2x 4GB = 8GB. You will get what you see in the photos ONLY. BATTERY IS INCLUDED. Hard Drive. Technical Specifications.